I'm very excited to be a part of Kristyn and Anne's Between the Lines link up again this month. Last month I didn't finish the book in time for the link up, but I LOVED it. I wish I finished it in time for the discussion. I stink. The length of this month's book was much more manageable and I finished it a long time ago actually. 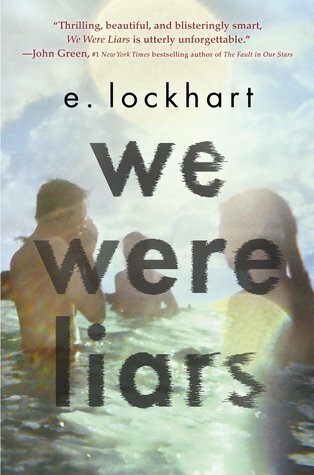 We Were Liars by E. Lockhart is one of those books that you can sit down and read in one, rainy afternoon. Even though it's a little bit heavy, it is pretty easy to get through. We Were Liars is the story of Cadence Sinclair Eastman (Cady) and her family. They spend their summers on their private Island just off Cape Cod. They are a family that values wealth, athleticism and beauty over everything. During Cady's 15th summer, she suffers a terrible accident, causing her to have terrible migraines and amnesia. Her family is being torn apart. The aunties fight, a new great house is built, and nobody wants to tell Cady about what happened to her. Some of her narration and description is very intense. She describes her migraines as blunt force trauma. It's hard to trust a narrator that constantly is exaggerating. I listened to this book as an audio book, and I thought the reader did a good job delineating when Cady was having times that were serious, and then times when she was floating off into memories, or maybe hallucinations. It's hard to say though, because with the end how it is, she could be hallucinating the whole summer. So I don't know. I don't know. I do think that they had a point, as unpopular as this opinion might be. I'm not sure how things would change with their situation otherwise. I just think that they got totally caught up in emotion, and that they didn't think anything through. Arson was definitely not the way to go about it and there were obvious consequences. I don't think this question has a black and white answer. I don't know if they are moving through patterns established in fairy tales, but they are definitely moving through patterns established in society. If you read other reviews about this book, there is a lot of comparison to King Lear. But when I was reading, I was thinking a lot about American celebrity families like the Kennedys. I don't know if that is actually how families with wealth actually are, but that is how the dynamic is perceived. The ending was a total surprise. I had no idea that anything like that was coming, but maybe I wasn't paying close enough attention. I was listening to this part while I was writing some things at work, and I had to stop for a second to process. It shocked me. Once it was described a little bit more, and I thought back on everything, it made sense to me and the storyline went together in my mind. I have been looking for a new book so I'll add this to the list! Awesome review! Thanks for the great review! Adding it to the list, I am always looking for new reads! I felt the same way you did about the ending. It was a shock but after I found out everything clicked and made sense. I read the same reviews you did...lots of mentions of King Lear! Thanks for joining us this month! If you don't use Goodreads already, you should! It makes all the difference, and it will suggest books to you! You can follow along with what I'm reading on there too. Thanks! You should join along in the link up! I love this link up! It brings lots of good books to my attention. I think we all had the same reaction to the end. Total and utter shock! That ending completely surprised me. I remember that I was reading one of the fairy tales right before they mentioned it, but man. I still didn't see that coming and definitely not what I thought would happen. It makes sense though, since the "Liars" were all in that one house and couldn't go to the big house. Crazy! Thanks for linking up! We Were Liars is one of my all time favorite reads from the last year. I really love all of e. lockhart's books but this one was totally different from her regular stuff; so haunting and twisted. The ending totally surprised me, as well! It is really twisted! I wouldn't say it was my favorite, just because it's not my favorite genre. But it was really good. I was SO surprised by the ending! I was really reminded of socialites when I was reading about the families. And a little bit about conspiracy theories... Maybe a mix between the Kennedys and the Hiltons? That's a weird mix and comparison, I know.